The following post on the usage of articles with proper names is not going to be 100% grammatically correct. It’s not that I’m going to insert typos here and there. What I mean is that the rules stated here are just rules of thumb and will not work all the time. I am not a grammarian; I am a teacher. Thus my aim is to compress complex grammar into a small pill that learners can take whenever they encounter a problem. Using this pill, students will make some mistakes, but most of the time they will get the grammar correct. 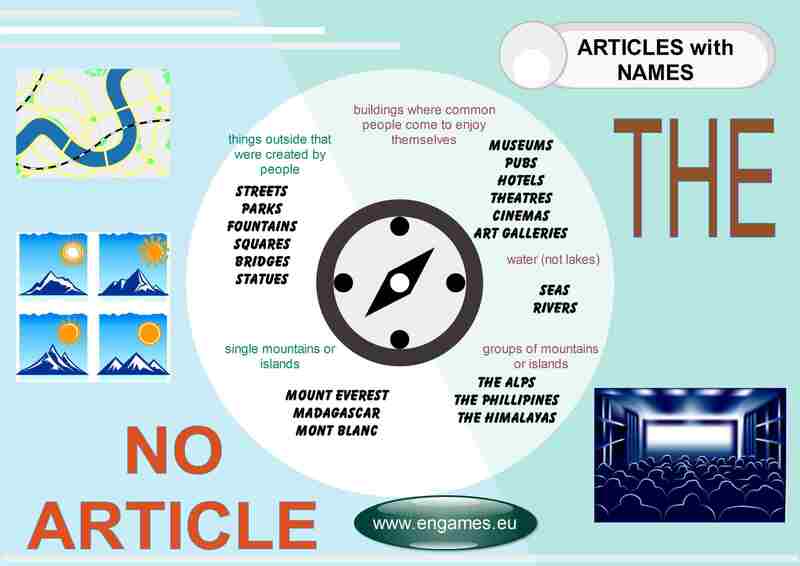 So in this post you will find a simple infographic explaining the usage of the definite article in front of proper names. There are also several games you can use to practise the most common English names. I hope you will find the explanation useful even though it will not work in all cases. Ask your students to look at the infographic. Explain that using the definite article before names is very complicated in English and there are very few rules to guide them. However, as they can see from the infographic, we managed to come up with a few. Explanation: Most of the man-made structures that stand outside (where they get rained on) do not take an article. Most of the buildings where common people go inside to enjoy themselves take the article THE. Thus it is Oxford Street, but the Ritz Hotel. Notice that palaces do not take the article THE because they are not for common people. However, the Tower of London takes the because it is for the common people :-). Now that you have explained the grammar, it is time to practise the grammar. You can use either some worksheets, or you can try our games here. The first game is called Penalty Shootout. In this game you should choose the correct option and then try to score a goal. Good luck. As the game is in Flash, it will only play on desktop computers. The second game is called Fling the Teacher. To win the game, you have to answer all the questions by choosing the correct options. If you answer all the questions correctly you will fling your teacher. (But I am sure that he/she will not mind as long as you know all the names that take articles 🙂 ). The game is in Flash and it will only play on desktop computers. No, I don´t mind as long as you provide a link to my website. Thank you.